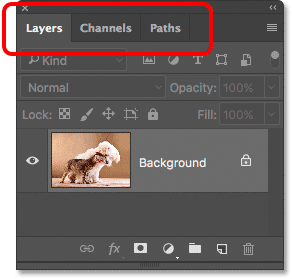 In this tutorial, we begin our chapter on Photoshop's interface with a quick, general tour of the main features the interface has to offer. There's lots that we can do with Photoshop, and over the years, Photoshop has grown into a massive program. But the interface itself is actually quite simple. In fact, there's really only a handful of sections we need to know about. We'll look at each of them in this tutorial. We'll start with the Document window, the main area where we view and edit our image. Then, we'll look at the Toolbar where we find Photoshop's many tools. Directly related to the Toolbar is the Options Bar. The Options Bar displays options for the tool we've selected. 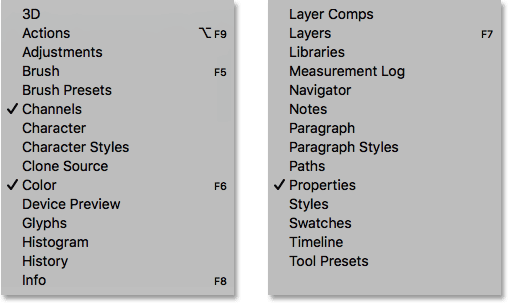 The Menu Bar along the top of the interface holds all sorts of options and commands related to files, image editing, selections, layers, type, and more. And the panel area along the right is where we find and use the many panels that Photoshop gives us to work with. We'll take a general look at all of these features here, and cover some of them in more detail in other lessons in this chapter. 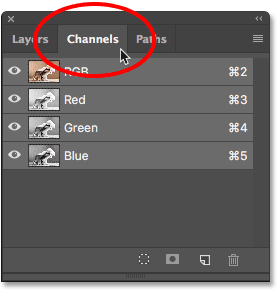 We'll also learn about the new Search feature that was recently added to Photoshop. And we'll take our first look at workspaces and how they customize the appearance of the interface. I'll be using Photoshop CC but this tutorial is also compatible with Photoshop CS6. 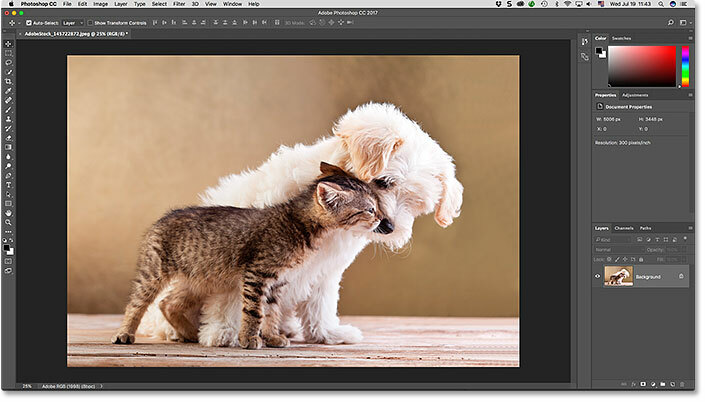 This is the first of 10 lessons in our Learning The Photoshop Interface series. Let's get started! The Photoshop CC interface. 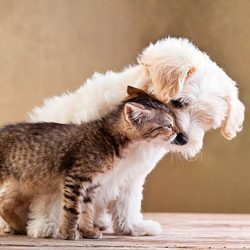 Photo credit: Adobe Stock. The Document window displays the image. The document's current zoom level (left) and the Status Bar (right). The Status Bar displays more info about the image when you click and hold on it. Use the Status Bar to view many types of information about your document. The Toolbar can be viewed as a single (default) or double column. Photoshop includes lots of tools. In fact, there are many more tools than what we see. Most of the tools in the Toolbar have other tools nested in with them in the same spot. Click and hold on a tool's icon to view a menu of the other tools hiding behind it. Most of the spots in the Toolbar hold several tools, not just one. Options for the selected tool appear in the Options Bar. The Options Bar updates each time a new tool is selected. 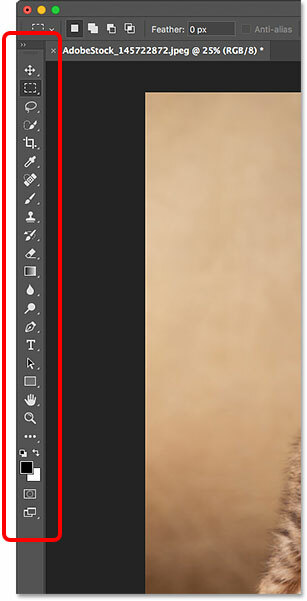 The Menu Bar runs along the top of Photoshop. The panels are located in a column along the right of Photoshop. The Layers panel is one of three panels in the group. Click the tabs in a group to switch between the panels. Selecting the Window category in the Menu Bar. The panels are listed in a long, single column. I've split the column in half here just to help it fit better on the page. To select a panel, click on its name in the list. A checkmark to the left of a panel's name means that the panel is already open. Selecting a panel that's already open will close it. 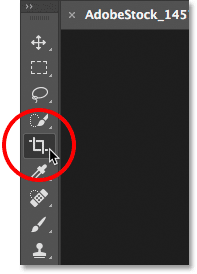 All of Photoshop's panels can be accessed from the Window menu. 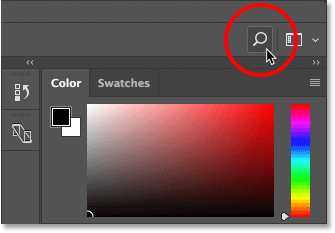 Clicking the Search icon (only available in Photoshop CC). Clicking the icon opens the Search bar. Enter your search term at the top. For example, I'll enter "Crop". The Search bar then expands to show you the results. Here, we see that searching for "Crop" found Photoshop's Crop Tool and the Perspective Crop Tool. It also found the Crop and Straighten Photos command, the Trim command and the Crop command. Click on any tool or command in the list to quickly select it. 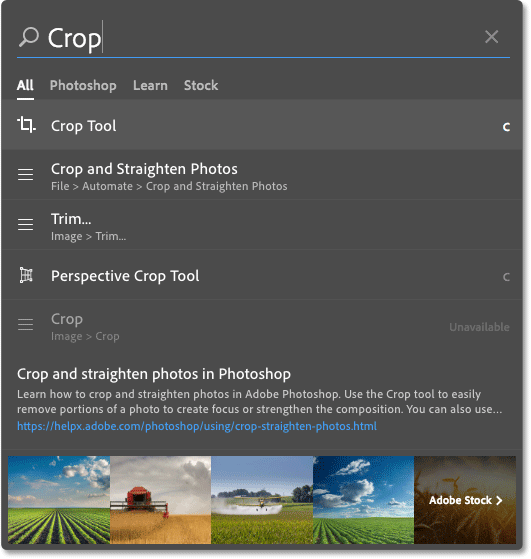 Below the tools and commands is a tutorial from Adobe on how to crop and straighten photos, as well as images related to "Crop" on Adobe Stock (although farming crops isn't really what I had in mind). 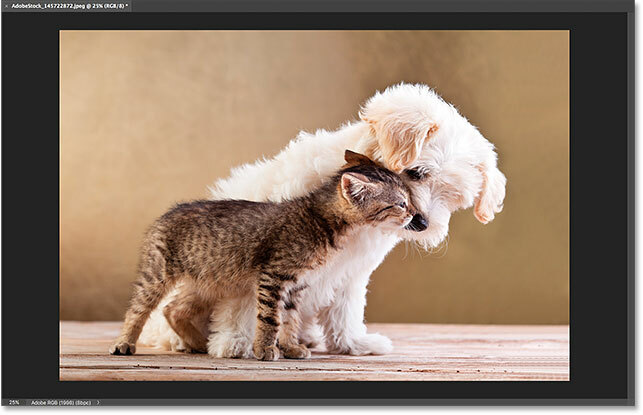 Clicking on a tutorial or an image will launch your web browser and take you to the Adobe or Adobe Stock website. Use the Search feature to quickly find what you're looking for. Finally, let's look at workspaces. 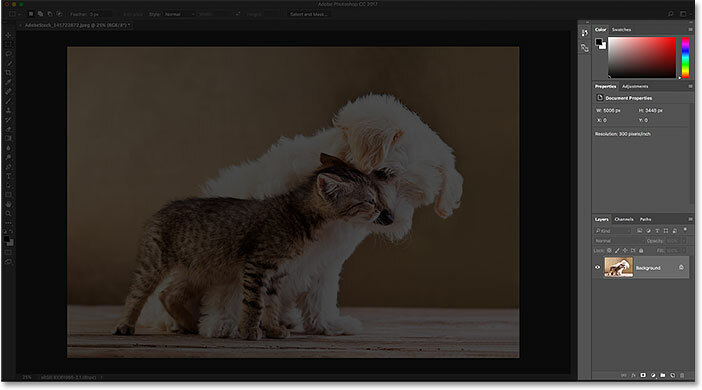 A workspace in Photoshop is a preset collection and arrangement of the various interface elements. 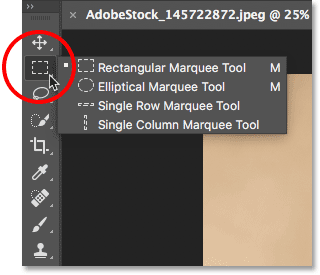 Workspaces can control which of Photoshop's panels are displayed on the screen, along with how those panels are arranged. A workspace can change the layout of the tools in the Toolbar. Items in the Menu Bar, along with keyboard shortcuts, can also be customized as part of a workspace. 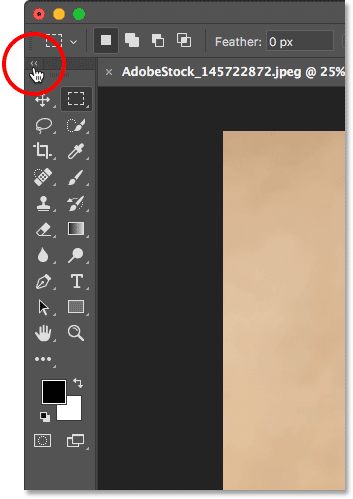 The Workspace icon in Photoshop CC. Click on the icon (or the selection box) to open a menu of other workspaces we can choose from. 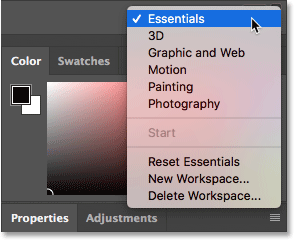 Photoshop includes several built-in workspaces. Each one customizes the interface for a specific type of work. As I mentioned, Essentials is a general, all-purpose workspace. If you're a web designer, you may want to switch to the Graphic and Web workspace. For image editing, the Photography workspace is a good choice. Keep an eye on your panels and on your Toolbar as you switch between workspaces to see what's changing. Use the Workspace menu to easily switch between workspaces. And there we have it! That's a quick overview of the interface and its features in Photoshop! 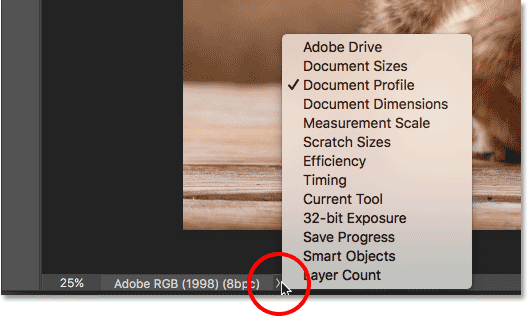 In the next lesson in this chapter, we'll take a more detailed look at Photoshop's Toolbar, including a complete summary of every one of Photoshop's tools!